From the far reaches of their empire, the Romans brought back all sorts of beasts for their menageries and gladiator spectacles—lions from Africa, bears from northern Europe, and ibexes from the deserts of the Middle East. If the empire had reached Australia, the Romans surely would have imported kangaroos, koalas, and other marsupials found nowhere else on Earth. Scientists have long pondered why different species are distributed in various places—a field called biogeography. The line of inquiry stretches from Aristotle, through Carolus Linnaeus, the 18th-century father of taxonomy, to Charles Darwin up to E.O. Wilson, who coined the modern term “biodiversity.” Until the 1970s, however, biogeography was a strictly terrestrial pursuit. In 1977, scientists diving on the Galápagos Rift in Alvin made a discovery that shook the foundations of biology. 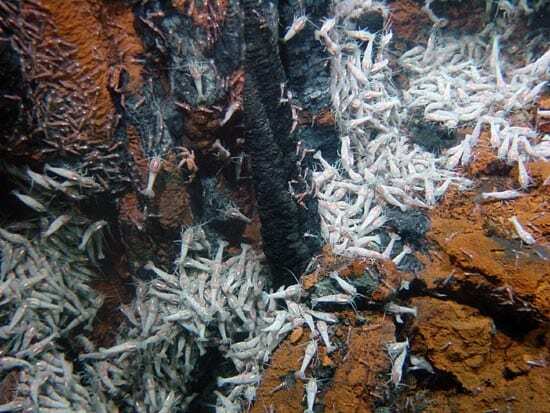 They found oases of animals thriving in the sunless depths around hydrothermal vents. Instead of photosynthetic plants, chemosynthetic microbes comprise the base of the food chain at vents. They obtain energy from chemical-rich fluids generated by volcanic processes on mid-ocean ridges, the 50,000-mile (80,000-kilometer) undersea mountain chain that encircles the globe and marks the edges of Earth’s tectonic plates. Since the discovery of vents, scientists have explored hundreds of volcanically active vents in the Pacific, Atlantic, and Indian Oceans. And we have found that on the seafloor, as on land, distinct animal populations have evolved in different regions. In the eastern Pacific, tubeworms dominate vent sites, but they are notably absent at vents in the Atlantic. 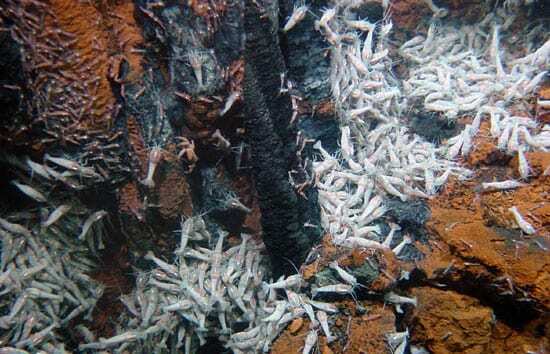 Instead, billions of shrimp swarm at vents along the Mid-Atlantic Ridge, which bisects the Atlantic Ocean floor. Both Pacific and Atlantic vents have mussels, but not the same species. Scientists today recognize six major seafloor regions—called biogeographic provinces—with distinct assemblages of animal species. Beyond the tubeworm-dominated eastern Pacific, there are two provinces in the North Atlantic, where different species of shrimp and mussels predominate at deep vent sites and at shallower ones to the north. The fourth province is in the northeast Pacific, off the U.S. Northwest coast, which shares similar species (clams, limpets, and tubeworms) with the eastern Pacific, but different species of each. Across the ocean in the western Pacific, vents are populated by barnacles, mussels, and snails that are not seen in either the eastern Pacific or the Atlantic. Scientists got their first chance to search for vents in the Central Indian Ocean in 2001 and found the sixth province. These vents are dominated by Atlantic-type shrimp, but also had snails and barnacles resembling those in the western Pacific. All these regions contain the same basic ingredients to support life—chemical nutrients generated by geothermal processes at hydrothermal vent sites. So why do vent fauna differ in the Atlantic and Pacific, or in the eastern and western Pacific? How do we assemble these puzzle pieces to explain the diversity and evolution of vent species throughout the world’s oceans? Which combinations of these variables limited or encouraged the dispersal of animal populations along the widely scattered, ephemeral patchwork of active vents on mid-ocean ridges? Which sent some populations down divergent evolutionary pathways, led others to extinction, and created fertile niches for yet others? Breakthroughs in biotechnology that allow rapid gene sequencing now give scientists powerful new abilities to compare genomes of different species to see how closely related they are and to examine how far back in time they may have diverged on the evolutionary tree. Determining evolutionary relationships among seafloor species and communities, and their distribution and biodiversity, will help unravel the evolution of life on Earth. And it will guide our search for life on other planetary bodies, where chemosynthesis may reign. Ecosystems on land and the seafloor differ substantially, but terrestrial evolutionary lessons may still apply to the deep sea. For example, as Australia separated from the ancient supercontinent of Pangaea and became an island, its animal population became divorced from other populations (including predators) and began to evolve separately. Did something similar happen on the ocean floor? About 40 million years ago, a continuous mid-ocean ridge system existed in the east Pacific, extending from below the equator to the coast of what is now the Northwest United States. In the continuing reorganization of tectonic plates on Earth’s surface, however, the North American Plate pushed westward. It began to override the Pacific Plate, forcing a portion of it underneath the North American Plate. (The San Andreas Fault in California is actually a fault between two mid-ocean ridges—a continuation of the East Pacific ridge system now on land.) Plate tectonics effectively disconnected northeast Pacific ridges from the rest of the Pacific ridge system. As a result, northeast Pacific vent communities diverged from their equatorial Pacific cousins. Both regions’ vents share clams, limpets, and tubeworms, but not the same species. Northeastern tubeworms (Ridgea piscesae) have skinny tubes, while eastern tubeworms (Riftia pachyptila) have fatter tubes. The geological evolution of mid-ocean ridges and ocean basins influences biological evolution in other ways. Hydrothermal vents are typically found in rift valleys at the crests of mid-ocean ridges, but there are striking differences in ridges. On the fast-spreading East Pacific Rise, rift valleys are typically 200 meters wide and 10 meters deep. But on the slower-spreading Mid-Atlantic Ridge, rift valleys are often 1 kilometer wide and 2 kilometers deep. Such deep valleys may have become evolutionary dead-ends for vent animals inside, whose larvae could not surmount the rift crests to disperse and colonize new vent sites. The deep valleys might also have blocked entry for competing vent animal larvae from outside the valleys, giving the inside animals a foothold to survive. Pacific and Atlantic ridges differ in other ways, too. Mid-ocean ridges are broken into segments by mammoth faults, called fracture zones, which intersect the ridges at roughly perpendicular angles. Ridge segments move apart along fracture zones, breaking the otherwise straight line of the ridge and creating a zigzag pattern of alternating ridges and fracture zones. In the Pacific, two ridge segments may be separated by 10-kilometer-long fracture zones. In the Atlantic, fracture zones typically span hundreds of kilometers—perhaps an unbridgeable gap for vent larvae dispersing into or out of the area. Topographical factors may also explain the unique biological communities found at seamounts—submerged volcanoes that typically are isolated from mid-ocean ridges. Vent communities at Loihi Seamount, an active subsea volcano near Hawaii, and at Edison Seamount, off the coast of Papua New Guinea, each have their own set of endemic species. Are vent larvae from these isolated seamount communities too far away to reach mid-ocean ridges or other hydrothermal vent locations? Or do seamounts, towering miles above the seafloor, cause deep-ocean currents to swirl around them—creating impenetrable vortices that dispersing larvae cannot breach? Despite their isolation, seamounts may play a vital role in the evolutionary history of seafloor life. Standing high above catastrophic seafloor events, such as mass extinctions, they might have offered critical refuges for vent fauna. Or they may have provided fortuitous evolutionary stepping-stones between mid-ocean ridge vent sites. Into this complex equation, scientists have added new variables by discovering other deep-sea habitats that foster chemosynthetic life. In shallower seafloor regions on continental margins, for example, naturally created methane and hydrogen sulfide seep from the seafloor. These so-called “cold seeps” support chemosynthetic ecosystems (including tubeworms, mussels, and shrimp) that are different but analogous to vents. Genetic studies have shown that tubeworms at seeps and vents are not the same specie, but the two habitats do share 13 species. Over evolutionary history, did species migrate back and forth between seeps and vents? Fossil records show that ancestors of vent tubeworms, barnacles, and limpets are as old as the dinosaurs. Several mass extinctions, like the one that annihilated the dinosaurs, have occurred in the deep sea. Could seeps or vents act as deep-sea refuges, where colonies of animals survived catastrophes and subsequently reseeded populations? In 1987, Craig Smith of the University of Hawaii and colleagues found a thriving, diverse animal community on a whale carcass that had fallen to the ocean bottom. 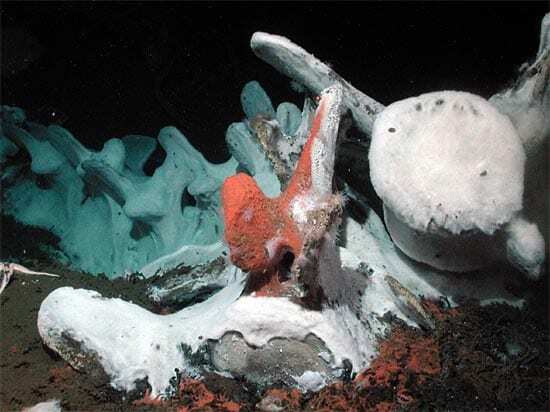 Microbes decomposing the whale’s soft tissue and bone lipids produced hydrogen sulfide nutrients similar to those that sustain vent communities. To date, more than 20 whale-fall ecosystems have been found. They share 10 species with vents and 19 with seeps. Similarly, wood—from trees discharged into the coastal ocean by rivers and mudslides, or from shipwrecks in more far-flung areas—also provides chemical nutrients from decaying organic matter to support chemosynthetic animals. Like seamounts and cold seeps, whale and wood falls likely play important evolutionary roles. Whale falls along migratory routes, and trees deposited near river mouths, may serve as stepping-stones to help disperse seafloor fauna. Shipwrecks may have introduced less natural, more recent seafloor stepping-stones. Recent evidence indicates that wooden shipwrecks began earlier than suspected in history, were not confined to coastal areas, and occurred more frequently than previously believed. Between 1971 and 1990 alone, an estimated 3,000 wooden ships were wrecked. To this expansive list of possibilities, we can also add biological factors into the evolutionary process. For starters, the proliferation of certain animals in certain locations is probably encouraged or discouraged by subtle differences in seafloor rocks, the chemistry of vent fluids, or other unknown factors. Tubeworms may have an advantage over shrimp at fast-spreading Pacific mid-ocean ridges where eruptions occur more frequently than they do in the Atlantic. Eruptions destroy vent populations. Animals stand a far greater chance of avoiding extinction caused by frequent eruptions if they have evolved with the abilities to colonize sites, mature, and reproduce quickly. On the other hand, as these sites mature or become more stable, other animals may seize the advantage and overwhelm the original colonists. According to one theory, the newly forming Atlantic Ocean—small, shallow and more susceptible to evaporation—was more saline. Shrimp may be more salt-tolerant and may have settled first at nascent Atlantic vent sites. Once they took hold, species such as tubeworms could never attain a foothold. Shrimp assiduously scrape the surfaces of vent chimneys to harvest bacteria and, the theory continues, they would have consumed any tubeworm larvae that happened to settle long before the worms could mature. Plate tectonics may have played an evolutionary role in another way—by opening and closing passages between oceans. As Pangaea began to break up 200 million years ago, and North America and Europe separated from Africa, the ancient Tethys Ocean formed between them. It was the precursor of the Mediterranean Sea, and it allowed a free flow of waters from the proto-Atlantic Ocean to the Indian Ocean. Perhaps this bygone oceanic route links Atlantic and Indian Ocean shrimp populations, which are diminished at shallow Atlantic vents (800-1,700 meters/2,625-5,577 feet), more abundant at deeper Indian vents (2,400 meters/7,874 feet), and swarming by the hundreds of thousands at even deeper Atlantic vents (2,500-3,650 meters/8,202-11,975 feet). The shrimp’s predilection for greater depths may have allowed their larvae to disperse via deep currents from the Atlantic to the Indian Ocean—an avenue unavailable to other species—rather than via a route along the mid-ocean ridge, through the South Atlantic and around the Horn of Africa. Perhaps the explanation for distinct North Atlantic fauna—with its swarming shrimp and no tubeworms—involves other ocean gateways. The North Atlantic Ocean basin began to form about 180 million years ago, but South America and Africa remained connected until about 110 million years ago. That means that North Atlantic populations were isolated from the South Atlantic for some 70 million years. Further, the Drake Passage between Antarctica and the tip of South America, a crucial oceanic gateway connecting the Pacific and Atlantic, did not open until about 21 million years ago. Genetic comparisons of shrimp populations throughout these oceans will allow us to reconstruct the pathways of shrimp migration over evolutionary history and answer these questions. A similar combination of geological and oceanographic factors may also explain the Logatchev vent site. 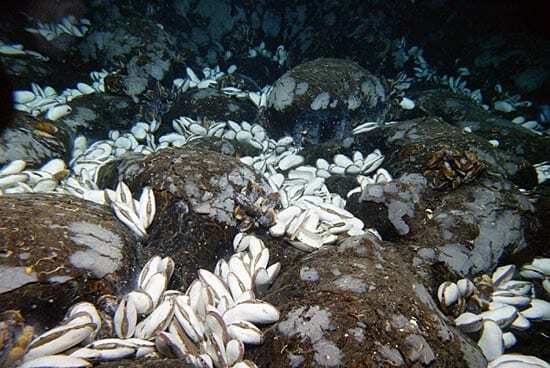 Discovered in 1994, it is the only Atlantic vent site where clams are known to exist. Logatchev, the southernmost known vent site in the Atlantic, is located just east of the Caribbean Sea. Did clams originally migrate from the Pacific via an ancient seaway that connected the Pacific and Atlantic—before the Isthmus of Panama rose about 5 million years ago to block it? Or did clam populations from western Pacific vents migrate around South America until they were impeded south of Logatchev by ocean currents or seafloor topography? 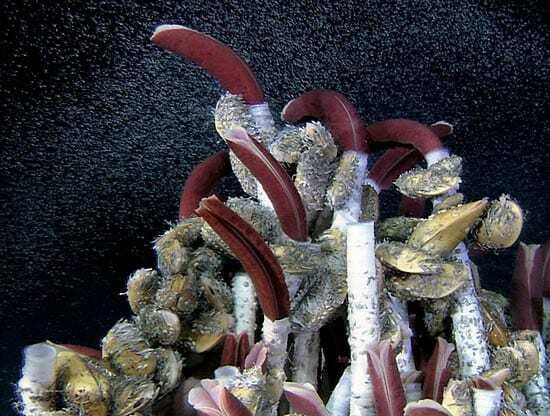 Or perhaps clams thrive in other Atlantic vents that we haven’t discovered yet. Complex processes create the patterns of vent populations we have seen. But we can’t truly begin to assemble this evolutionary puzzle without having all the pieces. Major regions of the seafloor remain unexplored. We have not yet located vent sites in the South Atlantic, for example. The puzzle pieces we do have indicate a disconnection between fauna in the North Atlantic and on other mid-ocean ridges. The most intriguing explanation may involve the Romanche and Chain Fracture Zones located near the equator, which are particularly huge—thousands of kilometers wide and tens of kilometers deep. A strong, deep current flows along and through these fracture zones, almost straight across the South Atlantic—at 1 million cubic meters per second. We think that the combination of these currents and fracture zones may act as physical barriers blocking the transport of vent fauna between the North and South Atlantic—a subsea equivalent of a Berlin Wall. To assess the critical factors that redirected evolutionary pathways, the first step is to actually locate and sample what’s living in key places for making evolutionary comparisons. Is South Atlantic vent fauna similar to that in the North Atlantic or Pacific? We will find out during an expedition in 2005, funded by the National Oceanic and Atmospheric Administration’s Ocean Exploration program, to search for vents in the South Atlantic. Proposed expeditions aim to add more missing pieces in the largely unexplored Southern Hemisphere. In 2006, we hope to explore the seafloor off New Zealand, which offers a natural laboratory to explore relationships among the full spectrum of habitats supporting seafloor life (vents, seeps, whale falls, and shipwrecks) that exist in close proximity there. Expeditions proposed for 2006 to the Chile Rise offer a similar opportunity to examine—all in one region—a diversity of chemosynthetic communities, along with a wide range of plate tectonic processes, from mid-ocean ridge spreading to an oceanic plate being subducted back into the mantle. It also includes a triple juncture of mid-ocean ridges, where vent populations may converge or diverge. In 2006, NOAA’s Ocean Exploration program will fund expeditions to search for vents near Antarctica, on the East Scotia Rise and in the Bransfield Strait, which is strategically located at a narrow, but critical juncture linking the Pacific and Atlantic Oceans. The powerful Antarctic Circumpolar Current, rushing easterly through the Drake Passage, may prove to be a magic carpet dispersing Pacific vent larvae to the Atlantic, a wall of water preventing the westward flow of Atlantic larvae, or a bottleneck choking flow in both directions. The region also has a large whale population, giving us opportunities to explore whale falls. And the tempestuous Drake Passage and Southern Ocean ice have populated the seafloor with wood falls from shipwrecks that we will search for—including Sir Ernest Shackleton’s famous ship Endurance. There is another icy, unexplored ocean that we are eager to explore—the Arctic Ocean. In 2001, the spectacularly successful maiden voyage of the U.S. icebreaker Healy found evidence from water samples and seafloor rocks of far more volcanism and hydrothermal venting than was predicted on the ultra-slow-spreading Gakkel Ridge in the Arctic Ocean. Are Arctic vent species similar to those in the Atlantic, the Pacific, or to neither? Our current knowledge suggests that the Arctic Ocean has never maintained deep-water connections with neighboring oceans. We theorize that Arctic fauna has evolved in isolation—producing fundamentally different kinds of species. Perhaps species dwelling on the remote Gakkel Ridge are “living fossils”—relicts of ancient species that continue to thrive today just as they have for tens of millions of years. In 2007, we will return to the Gakkel Ridge on an expedition funded by the National Aeronautics and Space Administration’s Astrobiology Science and Technology for Exploring Planets (ASTEP) program. To explore beneath the ice, we will employ new autonomous underwater vehicles built at Woods Hole Oceanographic Institution, including SeaBED, PUMA, and JAGUAR. WHOI is also designing and building a cutting-edge Hybrid Remotely Operated Vehicle (HROV) called Nereus, which will be able to operate at depths up to 11,000 meters (36,000 feet) in two modes: as an autonomous, or free-swimming, vehicle for wide area surveys, and as a tethered, or cabled, vehicle for close-up sampling and other tasks. When Nereus is ready, we plan to take it on a cruise funded by the National Science Foundation to the Challenger Deep, a trench off the Marianas Islands in the western Pacific that is 10,923 meters (35,838 feet) deep—deeper than Mount Everest is tall. In a place where the pressure reaches 16,000 pounds per square inch, we will find out if these extreme conditions have spawned uniquely adapted life forms on the seafloor. 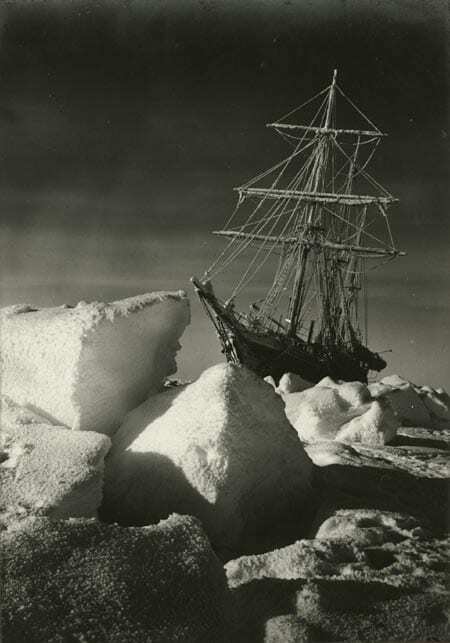 An Antarctic cruise in 2006 will search for the wreck of Ernest Shackleton’s ill-fated ship Endurance and test the theory that wooden wrecks play an important role in sustaining and dispersing seafloor populations. Exploring the deep The oceans average two miles in depth and in some places plunge almost seven miles - deeper than Mount Everest is high. Researchers at WHOI are developing a new underwater robot to explore these depths. Until now, these places have been beyond the reach of conventional technology.